(nothing else) ...and very powerful! You eat organic, so why not also put organic on your skin? Up to 70% of what you put on your skin gets absorbed into your body. The world's 1st Organic, Edible, 100% plants only skincare product with a ORAC Antioxidant rating of over 10 million (highest ever tested). The product is handmade in Malibu, CA. fresh in small batches. The ingredients are wild-harvested by hand from all over the world so our supplies are limited. The product has been recently endorsed by top celebrity skin guru in NYC, JoAnna Vargas and Dr. Howard Liebowitz, Anti-aging Doctor for Suzanne Somers and Dr. Phil. 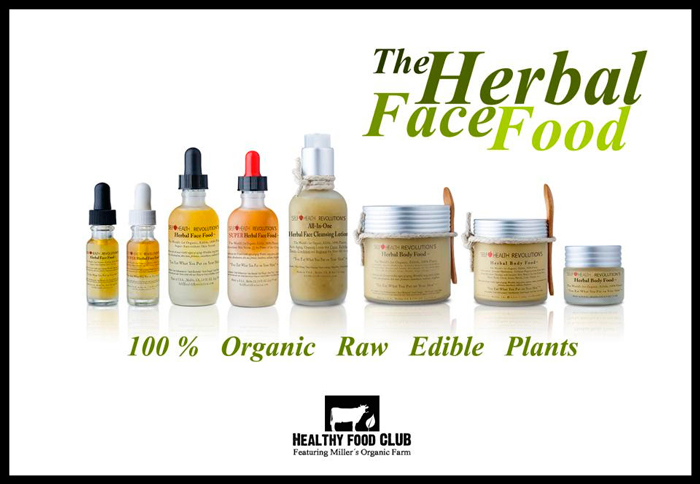 After the first application of the Herbal Face Food, you will be AMAZED with the results! The product has a very unique "herbaliciuous" smell and as it heats up on the skin, it creates a VERY INTENSE hot, burning, stimulating sensation. This is a little unusual at first, but as you keep using the product, you are almost looking forward to this temporary "hot flush"! You can feel every cell in your face absorbing this magical product and your skin healing from the damage of sun, discoloration, acne, eczema, psoriasis and even rosacea. harsh cleansers. It’s gentle enough to be used daily-soothes the skin and leaves it ultra-soft. The product is Soap-free and gentle enough for use around the eyes. Self Health Revolution’s Herbal Body Food ™ is Organic, Edible, 100% Plants, Antioxidant Body-Butter that provides deep moisture therapy and intense skin repair for the entire Body (Face, Neck, Chest, Arms, Hands, Legs, Thighs, etc.). It also addresses the 10 most visible signs of aging: Wrinkles, large pores, dryness, redness, discoloration, skin tone, firmness, smoothness, radiance, brightness. Each bottle of Herbal BODY Food has the Organic Herbal Face Food inside, plus 7 of world's most powerful rainforest plants blended into a luxurious, antioxidant-based, butter that will hydrate, smooth and repair dry, damaged skin...reversing the signs of aging and much more.